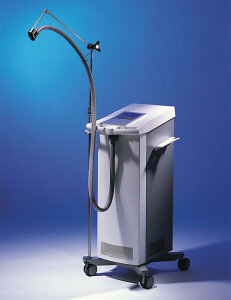 The Zimmer Cryo 5 Hose is six feet in length and is used with the Zimmer Cryo 5 cooler. This treatment hose has a plastic sleeve nut that allows the operator to easily connect the Cryo 5 Hose to the Cryo 5 cooler. When attaching the treatment tube to the cooler, set the plastic stop ring at the second thread and set the treatment hose at the outgoing air module. The correct distance between the stop ring and module should be about 0.5cm. Hold the Zimmer Cryo 5 Hose in place by pushing gently upwards into the air module, and than start to tighten the plastic sleeve nut by rotating slightly clockwise. By holding the treatment tube in place and rotating the plastic sleeve nut slightly clockwise, the Cryo 5 Hose will lock into place at the air outlet of the unit. Once the hose is in place, the Zimmer Cryo 5 cooler is able to quickly produce and maintain a -42c temperature at the evaporator, which results in released temperature of -30c air via the Zimmer Cryo 5 Hose. This cold air (-30c) is the result of the refrigeration components continuously working and cycling as the Cryo 5 cooler is on. The Cryo 5 hose can continuously provide the -30c chilled air to the treatment site safely and without frost buildup or leaks in the treatment tube. The Cryo operator can remove the Zimmer Cryo 5 Hose by removing the plastic sleeve nut at the outgoing air module, and then by gently pushing the treatment tube down. The plastic sleeve nut will release from the threads by turning the sleeve nut counterclockwise, after which, the treatment tube will release itself. 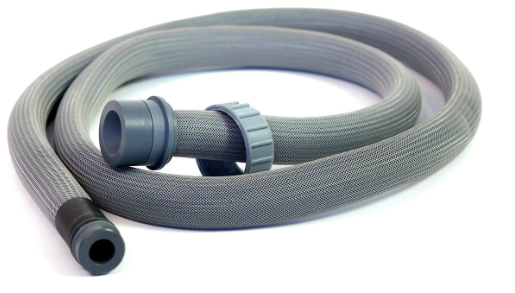 The Zimmer Cryo 5 Hose is simple to use and adjust. When relocating the Zimmer Cooler the operator should never pull the unit by the hose. The Cryo Five has four wheels mounted on the base of the unit which provides the operator a way to easily move the the cooler within a treatment room. The Zimmer Cryo 5 Hose should not be stretched or pulled on when trying to move the cooler or when trying to reach those hard to treat areas. Pulling or stretching the hose can cause damage, compression points, and holes inside the treatment tube. When trying to determine if the hose has been compromised, run your hand over the entire length of the hose to feel for air leaks, the Cryo 5 cooler must be running while performing this test. Some Cryo 5 Hoses that have air leaks in the tube might also present moisture or frost buildup at the site of the leak. The chilled air delivered continuously from the cooler to the treatment site should only be released at the distal end of the Zimmer Five Hose. If air is being released anywhere else along the hose, than a hole in the treatment tube might be present. If the Cryo operator has determined no air is blowing out from the tube or the stream of air is not as strong, he/ she may want to disconnect the therapy hose from the Zimmer Five unit and blow through it to check for blockages, holes, or compression points. Compression points, holes, and blockages effect the performance of the Cryo Five Cooler, and reduce the amount of air volume reaching a treatment site during Cryo use. You will need to replace the Zimmer Cryo 5 Hose if a hole, blockage, or compression point is determined. The Cryo 5 Handpiece inserts at the distal end of the treatment hose to provide the operator a way to control the air stream. The Zimmer Cryo 5 Handpiece can easily attach to the hose by gently inserting the Handpiece into the distal end of the hose. The plastic portion of the Handpiece slides in and out to extend range, and can provide a way for the operator to easily direct flow of air to those hard to reach treatment areas. The Zimmer Cryo 5 Hose can be used with or without the Handpiece. The Cryo 5 Handpiece is sold separate from the hose and is an accessory item. The Cryo 5 Articulating Arm can provide the Cryo operator hands-free use from the Zimmer Cryo 5 cooler. The Cryo 5 Hose clips onto the distal end of the Articulating Arm and hangs from the Hanger of the Articulating Arm. The Articulating Arm remains stationary over the treatments site until it is moved by the operator. The Articulating Arm has joints to provide flexibility and maneuverability of the hose when attached to it. The Zimmer Cryo 5 Articulating Arm mounts to the base of the Cryo 5 Cooler and has a stable pole that accommodates the articulating arm. The Articulating Arm is an accessory item that is sold separate from the Zimmer Cryo 5 Hose.